UPDATE! This villa has a brand new roof! This updated 2 bedroom, 2 bath courtyard villa in Villa La Paloma is the perfect spot to start your new retirement life in The Villages. Just a short walk to Tierra Del Sol Country Club, it's so convenient to the neighborhood pool, mailbox station, golf courses, Spanish Springs & Sumter Landing market squares. 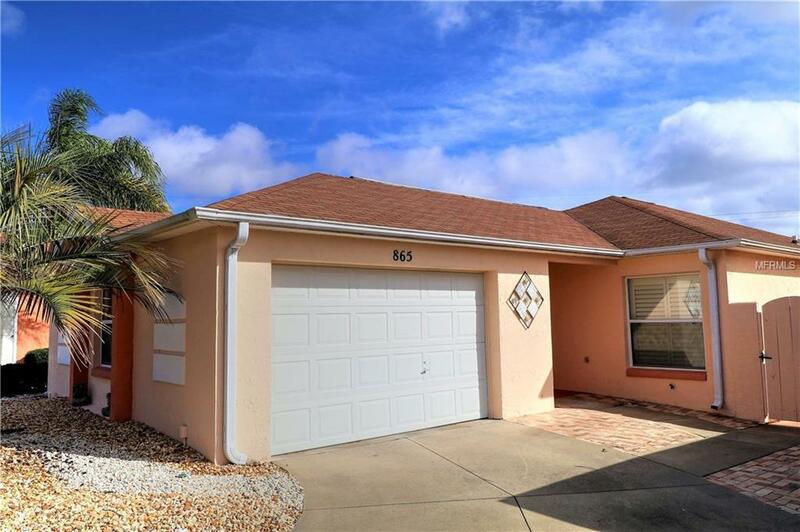 This remodeled home includes beautiful ceramic tile flooring, a sliding barn door to the guest quarters, granite counter tops, newer stainless steel appliances, updated kitchen & bath cabinets & hardware, freshly painted interior, plantation shutters, ceiling fans, new AC chiller in 2018, screened lanai & best of all - a maintenance free yard! Dont let this charming villa pass you by. Home Warranty is included. Annual Property Taxes: $1,258.28; Fire $124, Maint. $212.97. Bond paid. Click on the virtual tour link.